The Bright Star Monitor stations are a subset of the AAVSOnet. They offer members an opportunity to do CCD multi-filter observing of stars from 2.0 to 13.6 in Vmag with robotically controlled telescopes that are located from New Hampshire to Australia. Images are automatically calibrated and are provided to the user for analysis. They can also be directly forwarded to a VPHOT account. When epsilon Aurigae became an interesting target in 2008, it was pretty obvious that none of the telescopes that the AAVSO had access to was capable of obtaining photometry on such a bright object. We also realized that this was not an isolated case; there are hundreds of bright variables that are being overlooked by professionals and amateurs alike. Every current survey saturates on the bright stars. The one survey that came closest was the All-Sky Automated Survey (ASAS), which has not released any new public data since 2009. With its wide-field cameras, it monitored variables from about 7th magnitude to about 14th magnitude. The visual observers have been doing an excellent job of following the bright long-period variables, like Mira, R Sct, etc., but all of the bright low-amplitude variables, such as the naked-eye Cepheids, Algol, etc. are not being followed with high precision. We looked at what would be required to do the job. You want something with small aperture, so that any shutter in your system will yield short enough exposure times to not saturate the variable. You want good images, so that contaminating stars can be avoided. You want multiple filters so that the data can be transformed. A wide field is essential since bright variables seldom have an equally bright comparison star nearby. A good mount is needed so that you can set to multiple fields during the night and move all over the sky. Putting the system at a dark site was not important (since these are bright targets), but you want it located at a site that gets lots of clear weather. Complete robotic operation is essential, since exposures would be short and lots of movement would happen all night long. It would also be nice to use only commercial equipment and software, so that the system could be replicated easily. We looked at simple, inexpensive systems. Using a DSLR is one option, mounted on a decent telescope mount. We were concerned about the lack of standard filters, the limited dynamic range of the cameras, the more restricted wavelength range, and the poorer remote interface. Such a system is capable of 0.02mag photometry, however, and should not be overlooked for use by others. Hooking up a CCD camera to a commercial telephoto lens is another option, and in fact is what ASAS uses. A high-quality lens is not cheap, and is difficult to focus remotely. Still, many systems use similar setups; StarDial ran with a 50mm lens and an ST-7 for nearly a decade, with good results (check out http://stardial.astro.illinois.edu when you have a chance!). BSM went the middle road. We decided to go with a scientific CCD camera, a filter wheel with filters, a GOTO mount, and commercial software, and to place it at a good site. Listed below are the main system parameters for the original BSM. Setting this system up was an exercise in scrounging. Several people (including Jim Bedient, Doug Welch and Donn Starkey) made donations to pay for much of the equipment. SBIG donated the ST-8XME and filter wheel as part of their corporate sponsorship of the AAVSO. Doug George of Cyanogen contributed MaximDL. Bob Denny of DC3 Dreams contributed ACP and ACP Scheduler. It would cost about $7,000 to duplicate this system. 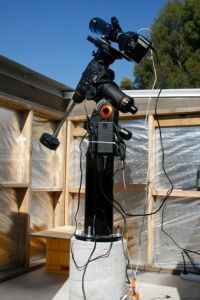 You could do it much cheaper, though with less flexibility; for example, using a short-tube refractor, an ST-402 camera that includes a filter wheel, and using less expensive software. The AAVSO is currently considering adding a BSM section to help coordinate operations and the upgrade of the network hardware, software and system protocol. For exposures, 30 seconds in V saturates at V=6.5 and has a limiting magnitude of V=13. This means that with 0.3second exposures, you can do good photometry at V=2.0, and with 30 second exposures, you have signal/noise of 100 at V=10. The exposure ratios for B:V:R:I are 2:1:0.8:0.7, and the typical seeing ranges from 1.5 pixels to 3.0 pixels (purposely defocused to some degree, as the optics are perfectly capable of sub-pixel images). The field is flat and unvignetted. Below is a listing of the current and future sites for Bright Star Monitors. Telescope installed, waiting for good weather for testing. Observatory, mount, telescope, and software in place. This is the home of the The Martin Bruce Berry Telescope. Everything running, though under a temporary shelter.